Mauritania has to have one of the least transparent visa processes in the world. Like most countries in this part of the world, the embassy and consulate websites are either broken down or nonexistent. If you were to find the information that I have posted on this site, it would take you a long, long time. But, no need to fear, Visa Hunter is here to tell you just how to get a visa to Mauritania. Follow the links above. 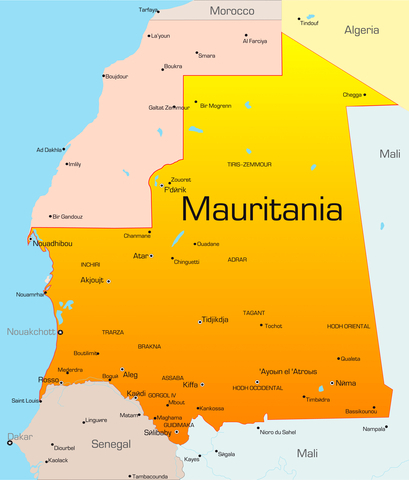 Mauritania is a developing country in the northwest part of Africa. The official language is Arabic, but many people speak French. Like a lot of other countries in this part of the world, there is a whole gamut of local languages, each with their distinct sound and tonalities. If your plans are taking you to Nouakchott (the capital of Mauritania), you will find that tourist facilities are sufficient. Outside of the capital, well….that is a different story! Hospitals and medical facilities are pretty slim pickings in Mauritania, so make sure that, in addition to bringing your Mauritania visa with you (if you need to get it, see my Mauritania General Information and Eligibility page), that you load up on the proper medications, such as Malaria prevention type stuff.